As I have said countless times before (and probably will again), I believe that credit cards are financial tools that can be used to improve your overall financial and credit profile. That said, if you are a credit card abuser, what are you doing to stop yourself from using cards – creating a more dire and irreparable wall of debt? Caution and diligence is the key to proper handling of your credit cards and paying debt. Here are a few things to do if you have debt, but can not seem to stop using your cards. Maybe you have seen the Dave Ramsey show. Dave has a slightly different view on credit cards than me, which is fine. He also has a section on his show in which people destroy their credit cards in strange, interesting and downright hilarious fashion. Destroying your card is fine, but if you eventually pay them down and learn to use them right (IE: pay them off every month), you may want to re-order them so they do not get closed and effect your credit score adversely. As of late, card issuers seem more eager than ever to drop cardholders that do not carry a balance or at the very least use the card occasionally. If you do not carry your card with you, you will not be able to use it. It’s that simple. Hide it in the back of your sock drawer or leave it in a safe deposit box to keep it out of reach. And for god’s sake, do not memorize the numbers…it just defeats the purpose when you do this and use the card online. Grab a post-it note and wrap it around your card. Write on it the things you want to save for, how much debt you already carry, and a reminder to not use the card at all costs. Sometimes it only takes a little nudge from yourself to open your eyes to what a problem this may be. The note may help, but if you are using your card all over town, and do not have a plan for repayment of every item you are purchasing, slow down. Before you even get to the checkout, whether online or in a store, stop yourself. Ask if it is really necessary to buy what is in your hand/cart/basket. 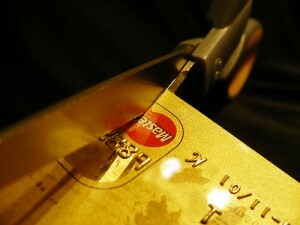 If it really is the only way you will be able to stop using your credit cards, call your issuers and close the card. If you are unaware, you can close credit cards that carry a balance. It may affect your credit score slightly, but if the final result is being free of high-interest debt, it will probably be worth it. If you can keep track of your “wins”…the situations when you would have used your credit card and used restraint, reward yourself (in cash of course). Use the “swear jar” method and give yourself a prize, even if it is just a few bucks. When you have a noticeably large amount in your jar, treat yourself, or even better, take one of the legs out of your debt pile.Â Every little bit makes a difference. If you really feel like you can not trust yourself with your credit card(s), put someone you trust in charge of your cards. This had better be someone you trust ABSOLUTELY, because if they have your card and go on a spending spree, you’re on the hook for the debt. I recommend all of the above methods more than this one. Anyone can get into a sticky financial situation, even your trusted loved ones. If you offer them the opportunity to scam you, and they are hard up, they could take you for a ride. *This advice is for credit card users who can not seem to stop using cards, despite their best efforts. If you are living off of your cards, this post will not help much. Using a credit card for everyday expenses like groceries or household items without the ability to pay them with cash reserves is another issue altogether. If this is the case for you, you will have to work harder on budgeting and income, and the rest will come with time. Now stop using your cards and start getting rid of this annoying debt!